This dry seed is simply flavored with salt. Locals often add this to certain alcoholic drinks or take it with a shot of tequila. 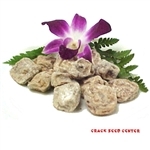 A similar seed to this is the Wet Salty See Mui or White Li Hing Mui which is not as salty.